They are very disappointed and concerned to see that the precarious situation of Europe’s performers is not addressed at all by these compromise proposals, which show a regrettable lack of understanding of what is really needed to provide a meaningful protection to performers in the digital environment. The provisions in articles 14-16 will not lead to any increased remuneration. Most performers cannot just rely on the measures in the original Commission proposal, as amended by the Estonian Presidency, to improve their situation, as they typically sign their contract without a chance to improve its terms. That is the way the industry works. If performers want to work, they must sign what is before them. Their only freedom is not to sign and thus not get their next engagement. Transparency measures may only be of use for a small minority of performers with enough leverage to negotiate on-going payments. However, this is not the case for the overwhelming majority of performers who simply sign buy-out contracts. Assuming that performers would seriously consider requesting a contractual readjustment (article 15) ignores the negative impact that any such request would have on the relationship with their producer, jeopardising further work opportunities in the industry, not to mention the amount of resources required to enter into a lengthy litigation process. As regards the sharing of value from digital use of works/performances, the discussions – also in the Council – have focused so far on article 13 and the so called “value-gap”, which will not – regardless of the final wording – address the needs of most performers. It will mostly benefit the corporate “creative” business who sign up performers and have the upper hand with respect to how they should be paid in return. The FAIR INTERNET coalition therefore calls for a right for all performers to be paid when their performances are used online via on demand platforms such as iTunes, Netflix or Spotify. Such payment would be paid by the online platforms and be subject to mandatory collective management. This is the only mechanism that can improve the livelihood of all performers in a meaningful way. Comparable mechanisms already exist in European legislation. For instance, the right to equitable remuneration for broadcasting and communication to the public (e.g. TV and radio broadcasting) provides performers with a fair revenue share, irrespective of the terms of their contract. The FAIR INTERNET proposal has already received support from within the European Parliament. 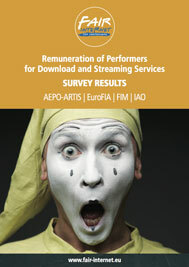 On 11 July 2017, members of the European Parliament Industry and Culture committees adopted opinions supporting the right of performers to receive an unwaivable remuneration for on demand use. Amendments tabled in the lead Legal Affairs committee also suggest broad political support. The FAIR INTERNET coalition calls upon Member State governments to support a right to remuneration for all performers, in order to effectively rebalance copyright and ensure that Europe’s performers are at last fairly rewarded for the on demand use of their performances. More detailed and extensive comments by the FAIR INTERNET coalition to the draft Copyright Directive are included in the ANNEX here attached. We rest at your disposal, should you require any further information.